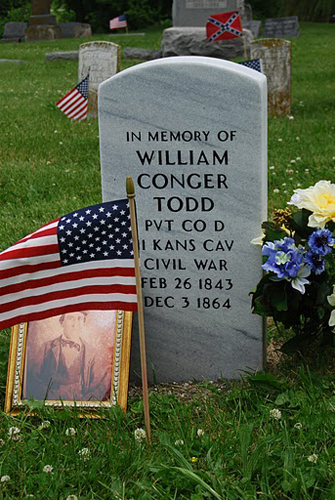 Private William C. Todd, was born on Feb. 26, 1843, his father was Jonathan Conger Todd and his mother was Mary Elizabeth (Hubbard ) Todd. He had seven brothers and three sisters. He enlisted in the Eleventh Kansas Volunteer Cavalry Co. D., Private, on Aug. 25, 1862 and mustered in on Sept.13, 1862. He died at Independence Mo., on Dec. 3, 1864, from wounds he received at Platte Bridge in Dacotan Ter. He's on the rosters as being from Oskaloosa, Kansas. 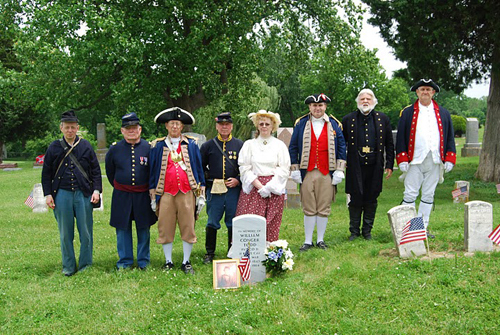 Shown here is both the MOSSAR Color Guard Team and Sons of the Union Army of the Civil War, who participated in a Grave Marker Dedication for Private William Conger Todd. The Color Guard team participated in the Memorial Day event located at Woodlawn Cemetery in Independence, MO. These pictures are a solemn reminder of the veterans from all the nation's wars who are buried in Woodlawn Cemetery. Photo(L-R): Major General Robert L. Grover, MOSSAR Color Guard Commander; Compatriot Dirk A. Stapleton; and Compatriot Jesse Lybarger.